Roy Halladay rumors will continue to swirl throughout the week, even though Toronto GM JP Ricciardi's self-imposed trade deadline for Halladay of July 28th has passed. More teams are becoming players in the Halladay sweepstakes and have begun to make their offers. With the asking price seemingly a steady set of the following- 1 major league ready player (preferably a pitcher), 1 top pitching prospect and 1 much touted offensive prospect...teams like the Red Sox offering Clay Buchholz and the White Sox offering Gavin Floyd seem to be taking over as the more serious contenders to get a deal done with the Blue Jays. With the Phillies apparently stuck on not giving up Toronto's top wish list item, pitching prospect Kyle Drabek, they are rumored to be moving deeper into negotiations to acquire Indians lefty and reigning AL Cy Young Award winner Cliff Lee. If the Phillies can get Lee without giving up Drabek, that would be their more ideal swap. My opinion on Drabek being the piece that holds the Phillies back from making a deal is like this...What's the best projection for Drabek's career? He becomes a Roy Halladay calibre pitcher, right? Okay, so if you're trading him and get back ROY HALLADAY, what's the problem? 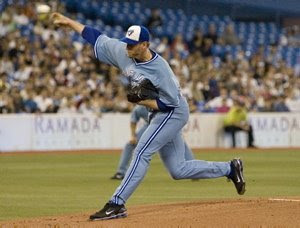 Halladay is an annual Cy Young Award contender and one of the best pitchers in the game. This type of talent would certainly help the Phillies in their pennant chase and post season this year and next season. Kyle Drabek most likely will not assist the major league Phillies this year. Make the deal happen. Ricciardi may need to consider how 23 days of being the main topic of North America's trade deadline discussions will leave Halladay feeling, if no trade is completed. He's their best player. Could all the chatter leave him with a sour taste in his mouth? Perhaps. And maybe next time around Halladay won't wish to deal with all of this again and won't cooperate with the Blue Jays and agree to wave his full no-trade clause. The Blue Jays are 11 games behind the Yankees in the AL east. Halladay makes 17% of Toronto's payroll. The Indians are 12 1/2 games behind the Tigers in the AL central. Lee makes 7% of Cleveland's payroll. Both teams have similar deficits in the standings, but with over sized contracts like Travis Hafner, Jake Westbrook and Kerry Wood on Cleveland's roster, Lee, who actually earns his salary, might not be an urgency for the Indians to part with or get a return for. Thus, the Indians may require an equally impressive offer, to what Toronto is wishing for, to let go of their ace, who will make just $8 million next season. The Phillies improved to a ML best 19-5 (.792 winning percentage) in July with their win over the DiamondBacks on Tuesday night. Consider that the Phillies began the month 0-2, and they've won 19 of their past 22 games. Raul Ibanez is hot on the road. This season, in 37 road games, Raul is hitting .325 (51-for-157) with 15 homers, 41 RBI and 32 runs. Raul has also safely reached base in 20 straight road games. Last season with the Mariners, Raul's batting average was 33 points higher on the road than it was at home. And here is a reminder that it's PhoulBallz Phillies Wednesday on The Shore Sports Report. The show is on daily from 3-6pm, and I'll be on at 3:30 to talk about the World Champions. Click here to listen. The show also has its own message board...you can find that here. Jay, I would much rather have Lee, he is younger, and more effective at this time than Halladay. He just doesn't get run support. His record doesn't show. :) I am having a great vacation.